If you are an organized individual who pays very close attention to detail and would like to pursue a job in criminal justice, you might want to consider becoming a detective. 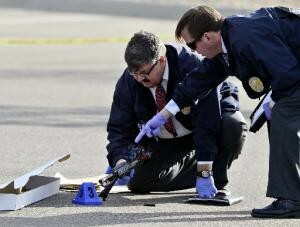 Detectives who work for law enforcement are responsible for collecting evidence at the scene of a crime, gathering pertinent facts from witnesses, and conducting interviews that could uncover criminal activity. The primary goal of the detective is to identify perpetrators and arrest them. Because detectives hold so much responsibility, you must get special training and may need a degree to get hired by local or state agencies. Here is your step-by-step guide on how to enter the field. Anyone who wants to pursue a career at any level in law enforcement will need to possess their high school diploma or a GED. After you have earned that credential, it is in your best interest to earn an undergraduate degree majoring in criminal justice. While it is not required in all regions and departments, having a minimum of an associate’s degree will get you noticed by hiring managers. The next step to entering the field is to complete a police academy training program and many times there are college programs that are integrated with academy training. You will learn skills in college, but you will learn the practical skills it takes to be in the force when you enter the policy academy. You will be seen as a recruit when you enter the program and will learn about the local laws, policing, self-defense, investigations and firearms. In addition to passing tests on the coursework, you must pass several physical exams to prove that you are fit. Physical exams test your stamina, endurance and strength. You cannot expect to complete the academy and be handed an investigative title right away. Before you can investigate cases, you need to get experience as an officer. You will respond to calls from the community and enforce the laws that you have learned. The number of years that you need to work in law enforcement depends on the region that you are in and the demand for detectives. If you request to work in the investigative unit as an officer, you will work closely with those detectives that you hope to one day work beside. You may not be the one investigating the crimes, but you will get irreplaceable experience that can push you forward quickly. Detectives are often required to pass a special examination that proves that they have the skills they need to manage conflict and follow procedures. Since one mistake can compromise a case, you will be tested also on investigative techniques and forensic science. Once you pass this exam, you will be a candidate for a promotion to detective. The demand for detectives is low and employment will grow by just 5% in the next 7 years. This is why you need to focus your efforts on education and advancement. Advancing in rank will take time, but it is a must when you work in law enforcement. Once you get hired by an agency, discuss your interests to work in investigations and complete all of the necessary continuing education courses. As long as you meet the requirements to get approved to enter the academy and you stay committed to the field, you will be on your way to becoming a detective.